Here is a great recipe I've been waiting to make from my favorite sassy baking blog, Bake and Shake. 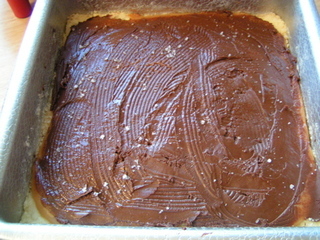 This is for Millionaire's Shortbread. They are so rich that I will call them Billionaire's Shortbread. Bake and Shake's look much prettier than mine, but these were pretty awesome tasting! 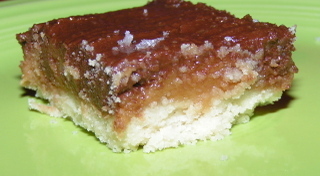 I had two problems - my caramel never seemed to thicken as I thought it should. After over 1/2 an hour, I gave up. I really don't know what to do to fix it. I also must not have melted the chocolate enough before deciding to spread. It was very thick and didn't set real nice on top. It is possible that it was because I used Chocolate Chips. I sprinkled Fleur-de-Sel salt on top. When I make again, I might consider pouring on a Ganache topping. My husband thought these were the best treats ever. Recipe after the jump. It still looks delish :-),and as long as it tasted good I would consider it a huge success! You're so right--the caramel takes FOREVER to thicken, and I almost gave up, my arm almost fell off, but I stirred and stirred and stirred until finally it thickened up enough. I don't remember how long it took, but it very well could have been over 30 minutes. Oy! But from the photos I've seen of this recipe, it looks like it's par for the course for it to come out looking "unique" to each baker. I think the taste is what is consistent--this recipe is consistently amazingly yummy! It totally tastes like a big Twix bar to me.